Home offices don’t typically invoke imagery of lush, tropical landscapes. Nor the soothing, green foliage, the calm gurgling of a waterfall, or anything reminiscent of a recent vacation. Often, they don’t fulfill our natural and often ignored, need to commune with the natural world. Instead, many home offices hum with the sound of an old desktop printer rocking atop its unsteady support and the slightly muffled voices of other—perhaps smaller—family members. They may be cluttered, small, or not yet fully furnished, undecorated and plain. But taking the time to add a few low maintenance plants can make a noticeable difference in indoor air quality, productivity, and most importantly your sense of wellbeing. Fortunately, even for the black thumbs among us, there are lots of easy to care for options that bring all the benefits of plant ownership with very little required work. Make your home office a happy and productive space with very little effort by acquiring a few green additions. According to a 2007 study in HortScience, the psychological benefits of indoor plants placed in a workspace includes a reduction in sick leave, increased productivity, creativity, and stress-reduction. 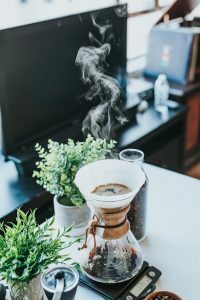 While we know that we should head to the park or take a walk when stressed or fatigued, many of us have never considered bringing the greenery into our workspaces. 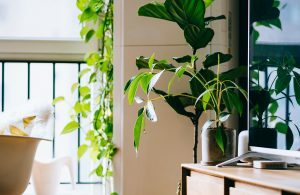 Adding plants to your home office is a simple change that can dramatically improve your workday. And caring for your new plants is even easier when your office is in your home. There will not likely be long gaps in time when you are unable to care for them. The benefits of having indoor plants don’t stop at psychological. There are also potent physical health benefits to bringing plants indoors. Houseplants have been shown to improve air quality and remove harmful chemicals from the air inside your home office. In 1989, NASA conducted a landmark study, testing which plants were most effective in reducing the presence of several common indoor air pollutants such as benzene, trichloroethylene (TCE), and formaldehyde. Five of the eight plants in this list were high achievers in the study, removing a larger percentage of these pollutants from the air. These high achievers include the peace lily, mother-in-law’s tongue, aloe vera, bamboo palm, and dracaena marginata. There are other important ways plants help to purify the air beside removing harmful chemicals. All plants take in carbon dioxide and release oxygen. This, in turn, makes your home office feel refreshed and oxygenated. Houseplants also provide a natural way to humidify the air, creating a more comfortable indoor workspace. The attractive and resilient peace lily is a great indoor houseplant and it would make a fantastic addition to any home office. Being one of the top air pollutant removing plants is not its only selling point. The peace lily allows you to have a stylish flowering plant that is best for larger workspaces. Some varieties can grow up to 50” tall. Care: Peace lilies prefer indirect, but constant sunlight. Placing them a few feet away from a north or west facing window is best. They prefer temperatures between 65°F and 80°F, so keep them away from drafty windows in the winter. The peace lily can even tell you when it needs water! You’ll notice a slight droop to the leaves when it’s time for the next misting. It might not have the friendliest sounding name on this list, but the mother-in-law’s tongue is actually low-maintenance and easy on the eyes. Not to mention extraordinarily quiet. This easy to care for plant has long, upright leaves that boast beautiful, white striped edges with deep green interiors. Smaller varieties can grow up to 1’ while larger plants used for outdoor landscaping can grow up to 8’. Care: Like the peace lily, mother-in-law tongues prefer indirect but constant sunlight, which means they need to be placed in a bright room a few feet away from the window. Mother-in-law tongues prefer drier soil, so water only when the soil becomes dry to the touch. Soil should be well-drained in order to keep roots dry and prevent root rot. The aloe plant is an ultra-low-maintenance home office plant. This guy will live happily alongside even the blackest of thumbs. Since they tend to grow more slowly when placed indoors, you won’t have to worry about them taking over your office any time soon. And the best part about having an aloe plant within arms reach: instant access to treatment for those frequent late-night papercuts. Care: The hardest part of caring for your aloe plant is reminding yourself to not care for it (almost) at all. Only water when the soil is completely dry. Aloes do require a lot of sunlight so your best bet is placing them in a sunny room with a south facing window. If you’re looking for a larger plant to place in an indirectly lit corner, look no further than the bamboo palm. With their long, thin fronds and bright green color, this palm is an elegant way to revitalize your home office workspace. Care: Bamboo palms like to stay moist at all times. Make sure to water them when the top of the soil becomes mostly dry. Place them in an indirectly lit corner for best results. You’ll be glad to know they thrive well in natural or artificial light, making these plants perfect for shadier home offices with smaller windows. If you don’t have the room for a big, leafy plant like the bamboo palm, you can always get a small, desk friendly cactus. Just make sure they get plenty of sunlight. These desert native plants will need it. Enjoy the cacti’s sculptural shapes which add a funky, modern feel to any existing décor. Among the most visually striking are the old lady cactus (mammilaria hahniana) and the barrel cactus (ferocactus). Care: Cacti should be watered sparingly, about once a week during their peak growing season which ranges from late fall to early spring. Lighting depends on the species of cactus you purchase. Watch out for signs your plant is getting too much light like having a yellow hue, or too little light, like extra growth in the direction of the light source. Draecaena marginata, also known as the dragon tree, is near the top of NASA’s air-purifying plants list, making it a great addition to any indoor space. Like the bamboo palm, the dragon tree offers a slightly larger alternative to indoor, office plants, and is best situated in a corner of its own. This plant comes in two branched or three branched varieties, with one set of spiny fronds per branch. Care: The dragon tree, like a lot of the indoor plants on our list, prefers moderate indirect sunlight. Place it in a sunny room but away from the window for best results. You’ll only need to water it when the top half of the soil is dry. Because they grow tall, dragon trees will need to be occasionally repotted or trimmed—but don’t worry—you’ll only need to do this every couple of years. Aside from certain types of cacti and expensive orchids, bromeliads are some of the only easy to care for indoor flowering plants. If you want to add a pop of color to your home office without lots of fuss, take a look at the wide variety of bromeliads available. Among the most stunning are the aechmea fasciata, with its bright, pink flowers, and the feather-like pink quill plant (tillandsia). Bromeliads can also thrive in low-light, making them perfect for a windowless or dimly lit home office without lots of direct sunlight. Care: Bromeliads have a built in “cup” at the center of their thick leaves which is called a tank. This means that watering them is a breeze—just fill up the tank! You can also place a small amount of water in the saucer of a bromeliad to keep its environment adequately moist. Make sure your bromeliad is away from direct sunlight to avoid yellowing of the leaves and other problems associated with too much light. Peperomia refers to a genus in the Piperaceae family which includes more than one thousand species. This means that there is a huge range of varieties to choose from. Among the most striking of these small, hardy plants, are the peperomia argyreia, or watermelon plant, whose leaves replicate the stripes of a watermelon, and the peporomia graveolens, which boasts longer, magenta edged leaves. Their wide variety of shapes and colors means that you can find the perfect peperomia for your home office, regardless of style. Care: Peperomia does well in lower light situations, such as a room with an eastern facing window or fluorescent lighting. Water the peperomia plants sparingly, allowing as much as 5” of soil to dry between waterings. Keep them happy and humid up by spraying the leaves occasionally. Adding low-maintenance plants to your home office makes your workspace more aesthetically pleasing. They also improve your productivity, creativity, lower your stress levels, and even remove pollutants from the air inside your home. 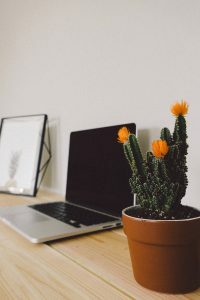 If you take some time to learn how to care for your home office plant and choose a long-lasting varietal, you will enjoy the benefits of your new workmate for years to come.